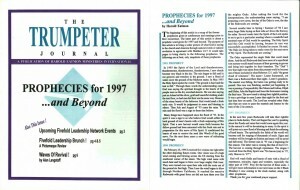 On February 20, 1996, I received five visions, one right after the other, depicting future events. A High Wind Blowing Across The U.S. The deep-rooted Oaks represent the men and women of God that stand alone. The tall Redwoods have more of a superficial root system and must grow in groves, knit together by their branches. The Oak I saw that night was taken from this present world three months later to become one of those included in what Hebrews 12:1 calls “the great cloud of witnesses.” His name was Lester Summerall. There was a Redwood there that night, Lester’s grandson. The mantel was falling; the baton was ready to be passed. One race was finishing, another just beginning. It was a passing of responsibility like Moses and Joshua, Elijah and Elisha, John the Baptist and Jesus, the forerunner, running the final race. The new breed is taking their rightful position. It was a privilege to meet Lester that night for the first and last time here on earth. The Lord has revealed other Oaks also that are soon to pass the mantels and batons by the turn of the 21st century. In the next few years Redwoods will take their rightful place in God’s plan. The Lord began speaking about the floods and rains that would come again this year. In the natural it will be devastating to many; in the spirit it will point out a new flood of blessing and finish the softening of hard hearts. The spiritually dry fields of the world will become soft for reaping of thousands of souls. Signs and wonders will be brought to fruition and many will be saved and delivered. The former rain was a beginning for this season. The latter rain is coming like that of Joel 2:23. The harvest is coming through repentance. God will wash the fields and hearts of men with a flood of repentance, miracles, signs and wonders. Pray for the harvest of these souls.